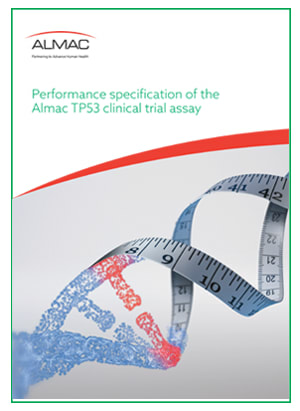 Almac has developed a CLIA-compliant analytically validated Next Generation sequencing assay for the TP53 tumor suppressor gene, which is linked to many cancers. This clinical trial assay (CTA) is intended to detect germline and somatic DNA aberrations enabling determination of molecular eligibility to facilitate clinical trial enrollmenT. This TP53 assay has been analytically validated for FFPE tissue using a dual amplicon workflow which can effectively determine true variants from FFPE artifacts. The TP53 Assay is designed and developed in accordance with ISO13485:2016 Quality Management System. This assay confidently confirms both Mutation Detected and Mutation Not-Detected status thanks to stringent individual base QC which are built into the QC software which has been developed in compliance with the IEC 62304 and ISO14971. Almac’s bioinformatics expertise can develop bespoke data filtering, annotation and reporting software on a per project basis. Almac are currently performing RUO level validation of the assay to permit retrospective testing of peripheral blood and bone marrow aspirate samples. 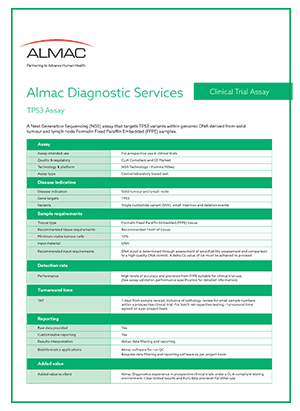 If required, Almac can extended this validation to make the assay CLIA compliant and suitable for prospective clinical testing.